Nespresso's got the coffee enthusiast on your holiday gift list covered with their new VertuoLine. The following content is created in consultation with Nespresso. It does not reflect the work or opinions of NBC Washington's editorial staff. To learn more about Nespresso, visit www.nespresso.com. This holiday season, celebrate the revolution of coffee with the new Nespresso VertuoLine -- the perfect gift and entertaining essential for every coffee lover. VertuoLine is the first Nespresso machine to deliver a delicious, high-quality large-cup coffee and authentic espresso at the touch of a button. Featuring an intelligent extraction system called Centrifusion™ and barcode reading technology, VertuoLine recognizes each of Nespresso’s twelve unique Grand Cru coffees to ensure that every blend is brewed in the most optimal way. The result is a rich, aromatic large-cup coffee or espresso topped with Nespresso’s signature crema -- a sign of high-quality coffee. With a choice of eight large-cup Grand Cru coffees and four espresso Grands Crus, the VertuoLine provides an option for everyone’s coffee preference. For over 25 years, Nespresso has redefined the way millions of people enjoy their coffee and has grown into one of the most recognized brands in the world. Nespresso’s success is built on the highest quality Grand Cru coffees, sourced from the top 1-2 percent of the world’s best coffee, smart and innovative machines, and personalized customer service. 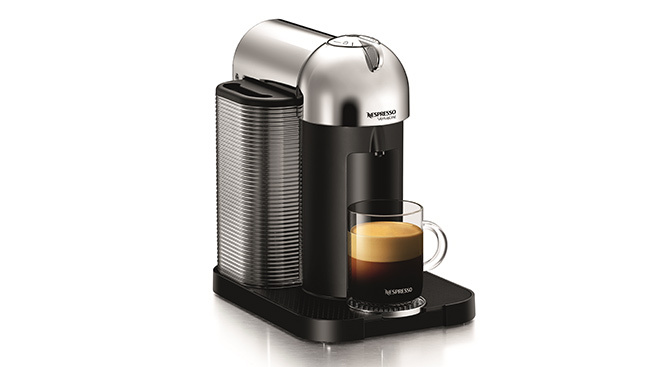 Nespresso’s stylish and easy-to-use VertuoLine and OriginalLine machines enable coffee lovers to prepare the perfect espresso, coffee, cappuccino or latte with the touch of a button. The award-winning and technologically-advanced machines manage all of the elements needed to deliver the perfect coffee, every time. If you are looking for a personalized holiday shopping experience visit one of the Nespresso Boutique locations. Nespresso Flagship Boutiques (New York, San Francisco, Beverly Hills, Dallas, Miami, Boston and Newport Beach) and Boutique-in-Shops are a fantastic place to engage with and purchase Nespresso products. At all locations, Nespresso Boutique Specialists are available to help guide customers through the full range of OriginalLine and VertuoLineNespresso machines and assist in sampling the Grand Cru coffees. At the majority of Nespresso Flagship Boutiques, holiday shoppers can sip and savor Nespresso Grand Cru signature coffee drinks as well as enjoy a menu of sweet and savory fare. The new NespressoVertuoLine is available in three unique colors, including Chrome, Black and Red, at Nespresso Flagship Boutiques, Nespresso Boutique-in-Shop locations, www.nespresso.com, through the Nespresso Club (1.877.964.6299), and at select fine retailers. For additional information on Nespresso, the VertuoLine System and Flagship Boutique and Boutique-in-Shop locations please visit www.nespresso.com.